The weather around the Karakoram peaks are making the early teams work hard to establish low camps. Other teams continue their treks to base camps. It is now late June so the weather can still be quite extreme (as if it never isn’t!) Make no mistake, the weather is the biggest challenge standing in the way of a safe summit, and return, for any of the five 8000ers in Pakistan. 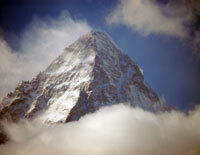 With K2 standing on its own making its own winds and snow, climbers on other peaks cannot take hints from it. Broad Peak a few miles/Kms away is also unique while the Gasherbrums are closer together thus providing clues. But Nanga Parbart, 170KM/105 miles, to the South has its own conditions. Today’s reports reflect these differences. Overall at this time in a 4-6 week expedition, the priority is two-fold: get the fixed ropes as high as possible and get the climbers acclimatized by sleeping as high as 7,000m/23,000 feet for at least one, preferably two nights. One of the issues is that an early team may get the ropes in but then weather moves in and buries the ropes effectively negating their hard, early work. This summer of 2018 is still early and the entire month of July has yet to begin so we have a long time (and way) yet to go. Akira Oyabe and his 10 member team from Japan have the route was completed to Camp 2, “… from now on, you will be able to set up a tent setup for C2 7350 M. It’s progressing nicely for a 1-month attack.” They are back at K2 BC holding for weather. There was very little snow this season in the Karakorams. Denis Urubko witnessed that on his K2 winter attempt and the Sadpara dam above Skardu that provides electricity to the community is almost dried out. How this will affect our climb and the conditions is hard to say but apparently the weather is much cooler and more humid now than my previous visits to the Karakoram. Several days with snow in Broad Peak BC has been reported and my concern is not so much the snow but if it starts heating up without a protective layer of snow, loose rocks (which becomes more frequent) is a challenge and a potential threat. Adam Bielecki says they got the route to Camp 1 from Gasherbrum I. He is with fellow Polish climber Jacek Czech and Felix Berg. They are targeting the Gasherbrums, starting with GII, then hoping to open a new route on the East Face of GIV. Bielecki was on the Polish K2 winter attempt just 6-months ago. After 20 hours (2 days) of effective climbing we managed to open the route to C1. Together with Jacek we have deserved gratitude of the other teams and a good rest in the base camp which we have just reached. Leveraging their work are Dávid Klein and Hungarian Szilárd Suhajda for GII and GI. They also spent a night at C1 according to their home team. Similar to a river of ice that stands between BP BC and the mountain, Gasherbrum has similar obstacle that is proving difficult this season. Daily snows of the last 15 days and the danger of avalanche on #nangaparbat made impossible for Alex and tunc access under reasonable safety conditions in the superior portion of the girl #diamir, in order to successfully complete the acclimation process. The Personalized weather forecast doesn’t look good until the end of the month. Before we can go to the final ascent, the two first need at least one night spent almost 7000 M, followed by a few days of rest in base camp. Then a minimum window of good weather is required in which conditions on the mountain allow for a good administration of the risk of a climb without additional oxygen. Mike Horn reports in saying a retreat is in order. NB is close to the KKH so easily accessible for a quick “holiday” to Islamabad unlike K2, BP and GI/II. Furtenbach Adventures spent one night at Camp 1 and tomorrow plan to go to C2 after spending a few days back at BP BC holding for weather. All good thus far … but the heavy snow is a bit concerning, especially after the dry winter as Fredrik notes. Hoping for the best for all. Not all that unusual. If it last through all of July, it will be, but I expect a break at some point for a couple of weeks. The question is, will it be one enough?